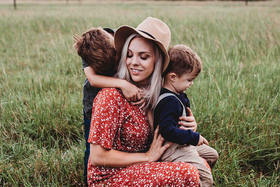 A new house and business equal a happy family life in Tiny Township. 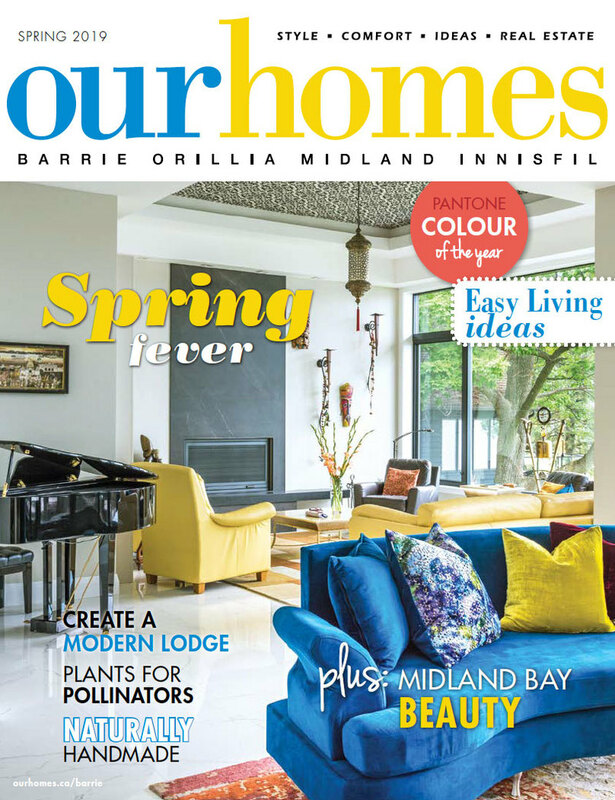 A version of this article originally appeared in the Spring 2019 issue of OUR HOMES Barrie Orillia Midland Innisfil, p.74. Find local businesses in our Barrie directory. 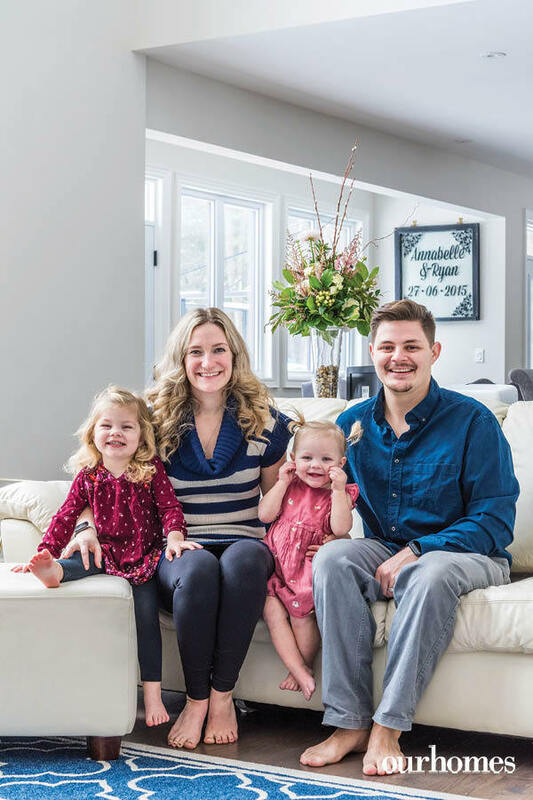 As the date approached for the arrival of their first child, Ryan and Annabelle Bazinet decided their house needed more renovations than they were prepared to invest in, so they sold it – and bought a vacant lot just down the street. 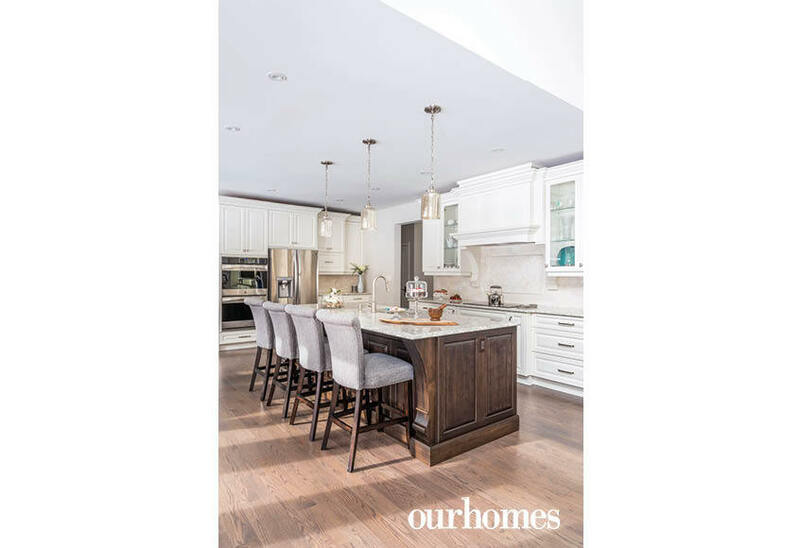 Their wish list included an open-concept kitchen, dining room and great room, bedrooms close together, a large master closet and a finished basement for entertaining. Upper-level laundry facilities, a practical butler’s pantry and an oversize, heated garage with four deep bays also joined the list. 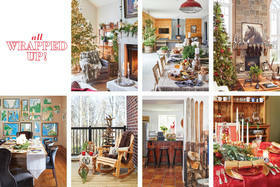 The result is a 3,800 sq. 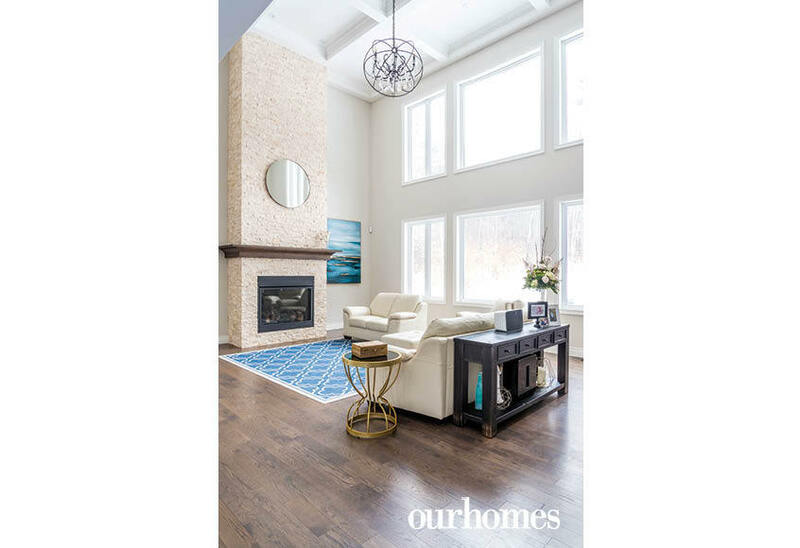 ft. contemporary home on a three-acre property in the Whippoorwill Estates neighbourhood near Perkinsfield. 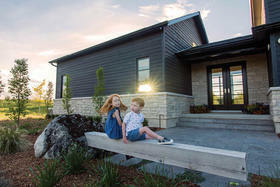 The Bazinets enlisted the help of second-generation custom home builder Joel Laurin of JVL Home Improvements Ltd. whose signature timber frame exteriors can be seen throughout the region. Annabelle and Ryan started their decision-making process with ideas from Pinterest. 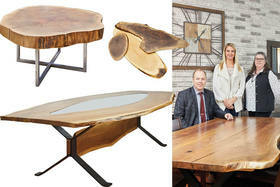 When Natalie Hutton Designs was invited to brainstorm, the ideas really started to flow. Natalie helped them pick finishings inside and out. The two-storey coffered ceiling in the great room, for example, came to life during those meetings with the addition of crown moulding and more box beams than originally drawn. 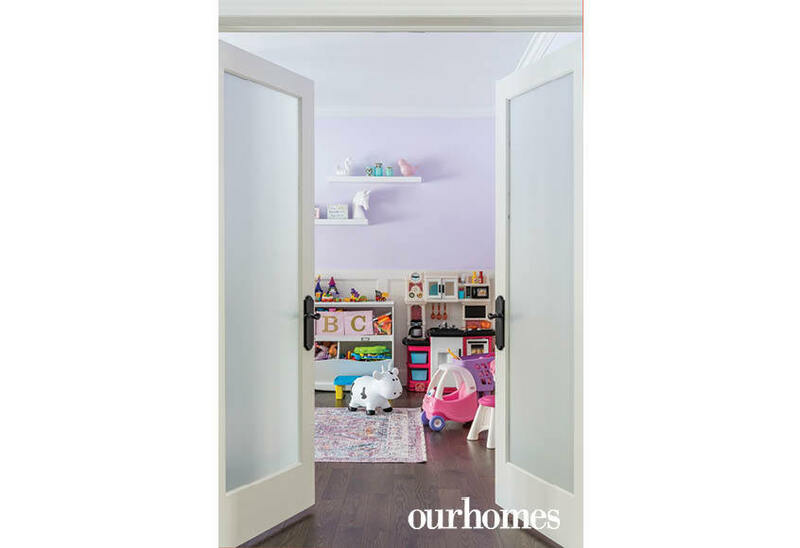 The walls downstairs were painted in Pale Oak by Benjamin Moore, a creamy neutral that shimmers as natural light dances through a wall of windows. Another development during the building process was the busy couple’s decision to purchase Perkinsfield Kitchen + Bath Inc. (PKB). Previous owner and Annabelle’s godfather Mike Desroches continues to be involved in the business he started more than two decades ago, as he trains Ryan and helps manage the transition. 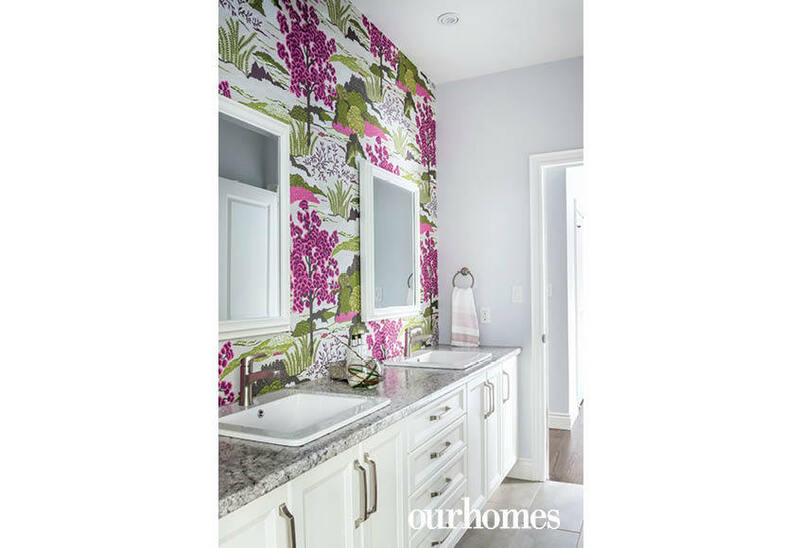 In Ryan and Annabelle's home, PKB completed all the bathroom vanities, the laundry/mudroom, the built-in bookshelves and, of course, the kitchen. Elegant Solutions supplied the Cambria quartz countertops. 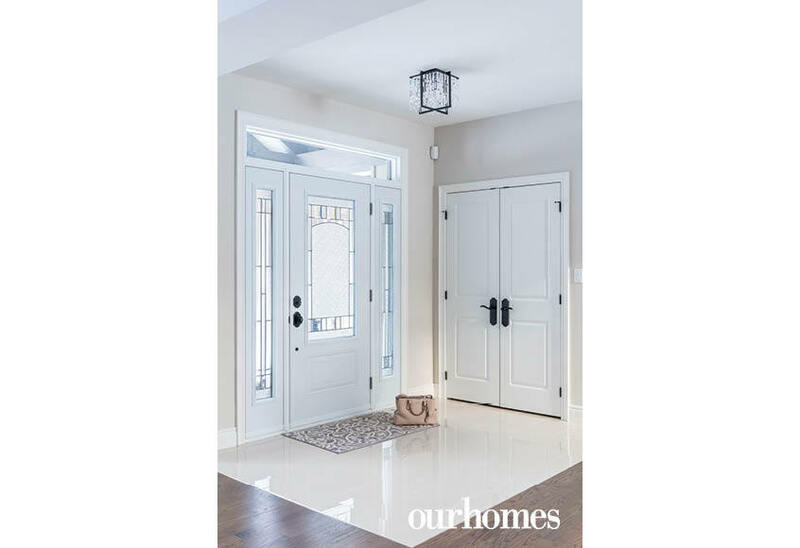 The front door with upper transom and stained-glass inserts opens into the foyer with a high-gloss tiled floor and a closet at the ready. The great room’s stunning stone fireplace rises two storeys to the elegant coffered ceiling. 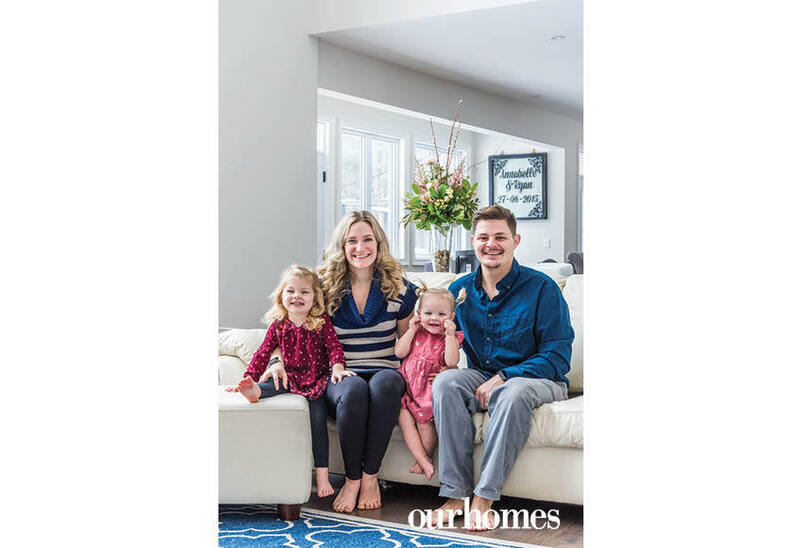 Annabelle and Ryan Bazinet and their two children relax in the great room of their new home. 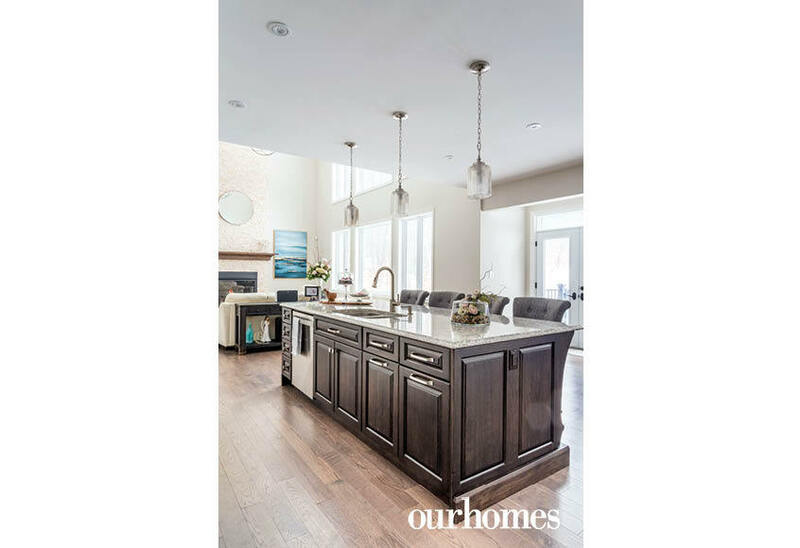 The couple are the new owners of Perkinsfield Kitchen + Bath Inc., and produced the beautiful kitchen in this home. 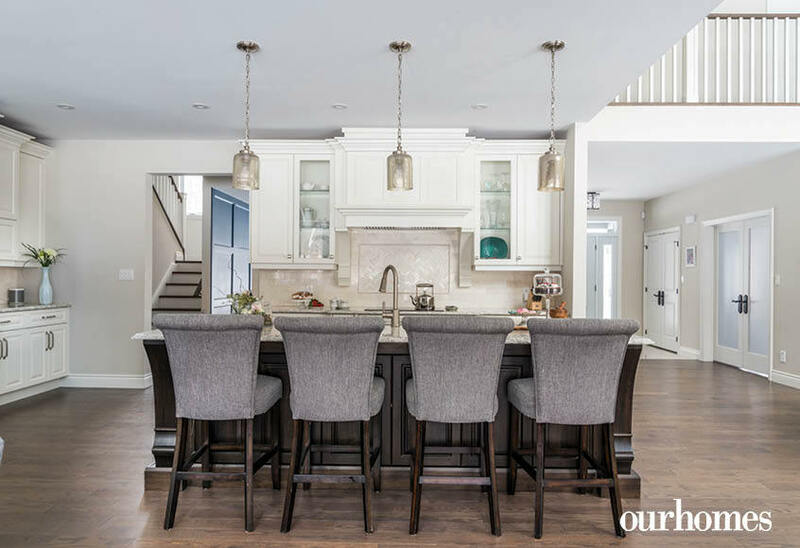 The kids can sit on the comfy counter stools and enjoy a snack while Mom and Dad prepare the meals in this beautifully appointed kitchen. A tile backsplash adds texture. Lovely mercury glass pendants hang above the island. 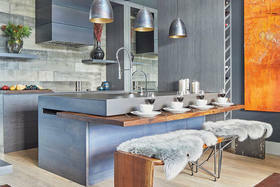 The generous, open kitchen has white upper and perimeter cabinets around an espresso-stained island. All counters are quartz. 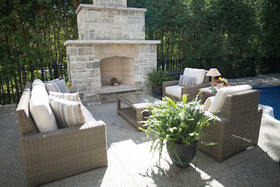 A built-in banquette just off the kitchen offers a view of the backyard and a family friendly gathering spot for meals. 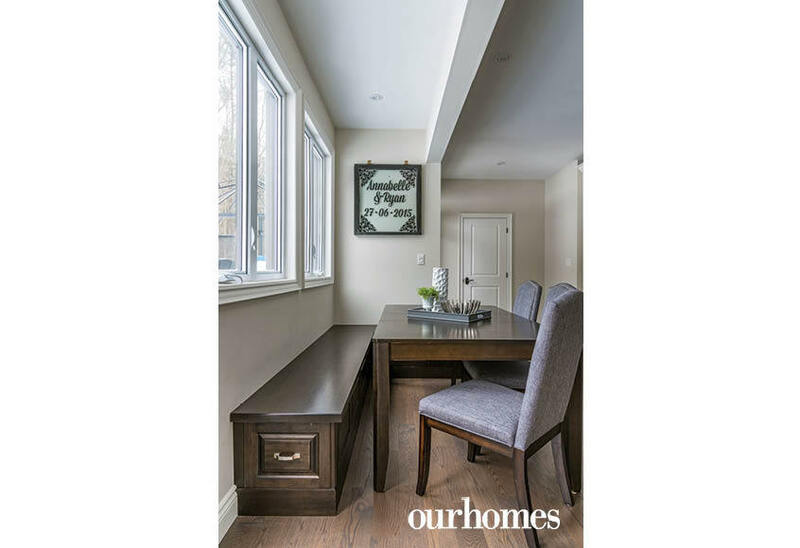 The panelled accent wall in the dining room is painted Hudson Bay by Benjamin Moore. 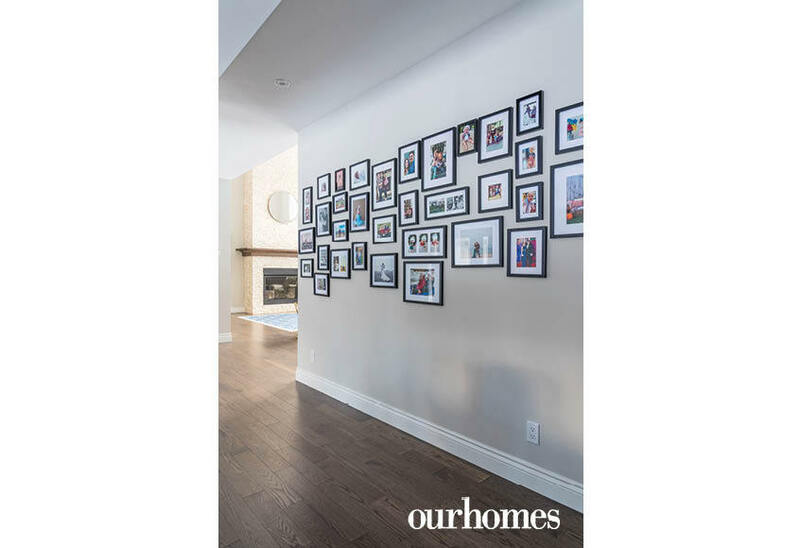 A gallery wall full of family photos lines the wall between the kitchen and living room. 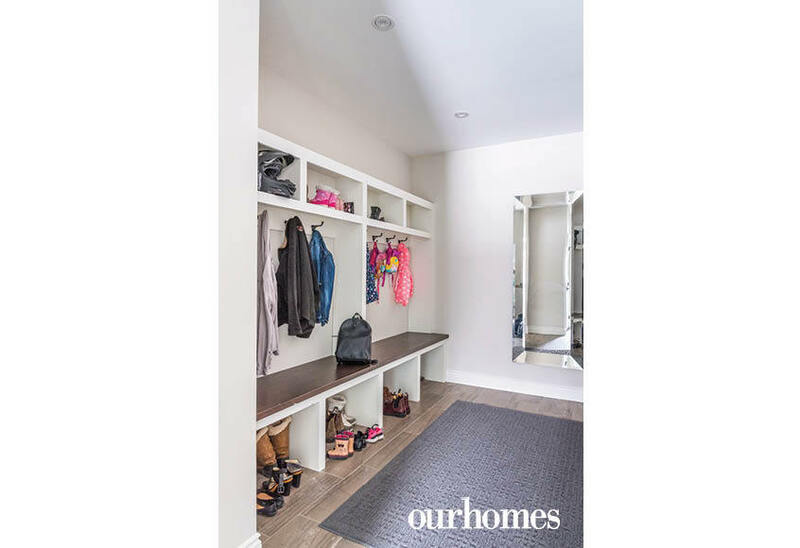 The organized mudroom exits to both the garage and to a separate exterior door. 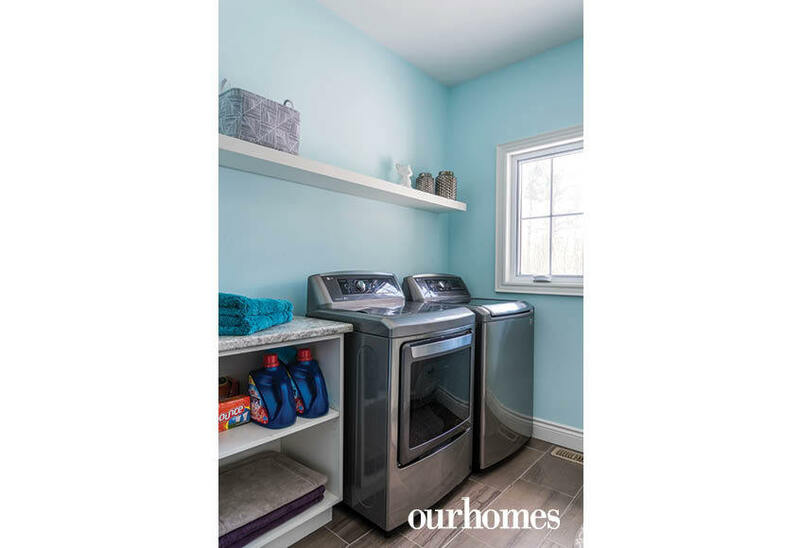 A turquoise laundry room is upstairs near the bedrooms. The owner’s principal bedroom suite is just down the hall from the girls’ bedrooms. A sitting area gives them a place to relax at the end of a busy day. The main-floor playroom is a space where the couple’s daughters can contain their toys and still have them nearby. A child’s bedroom has soft pinks and turquoises. 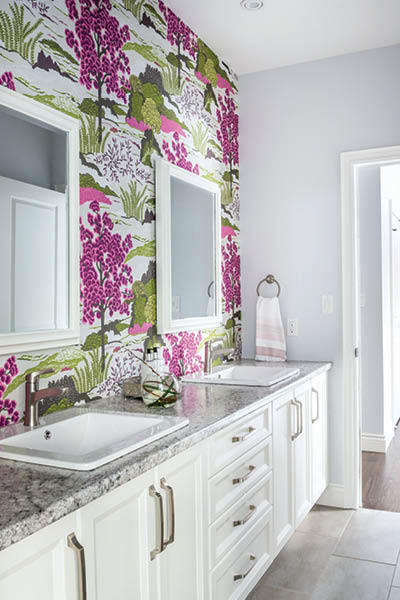 A Jill-and-Jill bathroom with flowered wallpaper is situated between the girls’ sweet bedrooms. 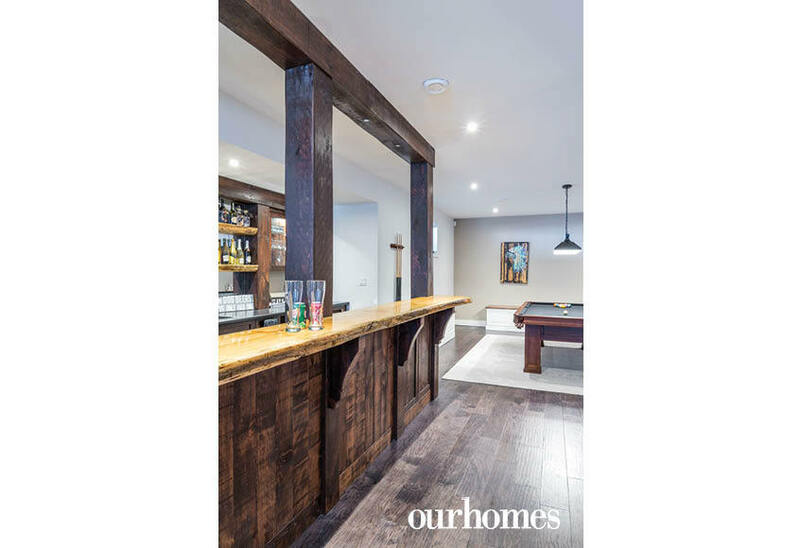 The homeowner built the bar in the lower level with a live-edge bar top. 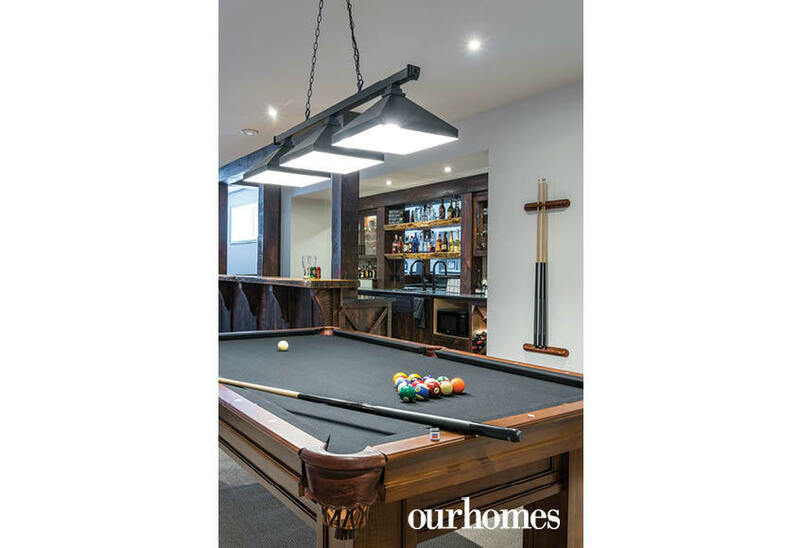 The pool table is the main attraction near the bar in the family entertainment room downstairs.